"I personally saw my driver after Desert Storm in his tank put a gun underneath his mouth and pull the trigger, while I was no further away from him than I am from you right now," Place told the Washington Free Beacon at the National Mall in Washington, D.C., on Thursday. 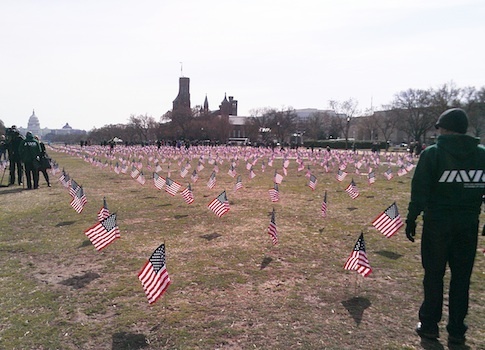 He was one of the dozens of activists with Iraq and Afghanistan Veterans of America (IAVA) who planted thousands of flags to honor veterans who had killed themselves. The message of the campaign is "We’ve Got Your Back," and for Place, serving in the Army is a "family business." "My son is still in active duty, he’s been an infantryman," he said. "I was in the 101st Airborne Division, he was in the 82nd Airborne Division, and just like his old man was when I was a young enlisted man, he kind of followed in my footsteps." "I served in the 82nd in Desert Storm," Place said. "So twice, I was on the initial invasion into Iraq, and then later on he came in to Iraq as I was coming out. And then he went on to the 82nd Airborne, and he went into Afghanistan as my unit prepared to relieve his unit in place in Afghanistan." Place retired in November. He is working with IAVA to help his fellow veterans get the help they need. "My son has had three of his close friends who have lost the fight to suicide," he said. "I have several friends who have either attempted or lost the fight to suicide. As a Battalion Commander, I had—for two years in command—multiple ideations, and a couple of attempts." "I’m in that 50 percent number," said Derek Bennett, who served two tours in Iraq before leaving the Army in 2007. "This is an aspect of the war we feel has not received the awareness that is due." IAVA honored veterans from all wars who have died from suicide on Thursday. One of the groups’ allies in Congress is Sen. John Walsh (D., Mont. ), the first Iraq war combat veteran to serve in the Senate. "This is a personal issue to me," Walsh said after the flags were placed. "I commanded an infantry battalion in Iraq in 2004 and 2005, where I took, what I like to say, over 700 of Montana’s finest young men and women into combat in Iraq for over a year. When we returned home, one of my young Sergeants died by suicide." Walsh introduced the Suicide Prevention for America's Veterans Act, which would allow veterans to receive mental health care for up to 15 years following active-duty service. Currently, soldiers can only get care from Veterans Affairs for 5 years. The legislation would also modernize the way the VA prescribes medication, and attempt to make mental health jobs at the agency more competitive with the private sector. Paul Rieckhoff, the founder and executive director of IAVA, said his group has held over 100 meetings in Washington this week, including with the Department of Defense, White House, and Capitol Hill, to raise awareness and lobby for Walsh’s bill. "It’s a personal issue for all of us," he said. Rieckhoff mentioned Clay Hunt, a former Marine corporal, who received the Purple Heart after being shot by a sniper in Afghanistan. After leaving the service in 2009, Hunt worked with Rieckhoff and IAVA’s "Storm the Hill" suicide prevention campaign, and helped build bikes for "Ride 2 Recovery," which holds bike races to help wounded combat heroes. But in 2011, Hunt took his own life, shooting himself in his apartment. "The flags we’re planting today are in memory of Clay Hunt and so many others," Rieckhoff said. "We know that Clay’s with us here, I spoke to his mother last night, and she’s behind us, and so many other families are behind us." Another family stricken by military suicide are the Ruocco’s. Major John Ruocco, U.S. Marine Corps, was a decorated Cobra gunship pilot and father of two sons. "He flew his last 75 missions in Iraq on his last tour," his wife Kim said on Thursday. "Upon his return, he suffered from post-traumatic stress, depression, and was suffering quite a bit." "My husband was not afraid of combat zones, or flying into fire, but he was afraid of asking for help," she said. "He was afraid of letting people down, like most of our marines, soldiers, airmen, sailors." "His last words to me on the day that he died was, ‘I’m going to get help, but we are going to lose everything because of it,’" Ruocco said. "He thought that going for treatment for his injuries would forever change the way people viewed him. He died of stigma, and stigma still continues to be one our biggest battles in our [fight] against suicide." Ruocco is now the manager for Suicide Outreach and Education Programs at Tragedy Assistance Program for Survivors (TAPS). TAPS helps at least three survivors who call the organization every day, seven days a week. Bennett said the message he wants to send to his fellow veterans is "you’re not alone." "You’re not John Rambo, this country shouldn’t think of you as an outlier," he said. "We all go through this experience together." Place wanted to emphasize that "it’s not weakness" for veterans to seek help. "We think it is," he said. "That’s the problem, we’re taught in the military to be strong and be tough, and endure, and when we’re in those dark places we don’t want to reach out for help, because we think it shows weakness." "I know there’s a lot of folks out there that might think that suicide is a scapegoat, it’s an escape, and you’re quitting, but when you’re a young person, and you’ve seen the things that we’ve seen, you’ve had to do some of the things that we’ve had to do, it can wear on you," Place said. "It’s really that invisible wound. And the toughest part is admitting it, admitting that you need help." This entry was posted in National Security and tagged Army, Feature, John Walsh, Marines, Military, Navy. Bookmark the permalink.